All families have to do chores. They a consistent part of every family’s life and they have to be done day in and day out to keep things running smoothly. Specific chores often get done at the same time every day too. They are predictable – part of the framework and fabric of family life. And, if done in the spirit of ‘togetherness and belonging’ they become a form of ‘glue’ that keeps a family together. This is why, in my Parenting on the Run workshops, I talk about the importance of involving children in doing the chores from an early age. Not only will you be bringing up helpful versus helpless children, but they will acquire life skills and competencies away from the academic environment of the classroom. They develop these skills in an unstressful and informal way, largely via sharing the task at hand with their parent, whether they are in the kitchen, bedroom, the garden or even the driveway. Think washing cars and bikes, sweeping the yard, watering plants, cooking, laying tables, closing curtains, packing away laundry, feeding pets, making beds etc. Kids have to muck in, tidy up and clean up mess. As OMO has always said, dirt is good. Dirt can be a really good thing for kids in their learning process. Here is an icon-based magnetic chore chart you can make for your children that will make doing the chores more rewarding for them. Life skills are being passed from one person to another via demonstration and doing things together. This means that there is also an emotional attachment involved in doing the chores – it develops relationships between adult and child. It is an opportunity for “togetherness” and the creation of rich family memories. In very busy families today, parents don’t have much time with their children. In fact, I have done a calculation that working parents spend between two and three hours a day with their children and most of that time is spent doing chores from shopping, to cleaning, cooking, homework, eating, bathing, packing bags and putting children to bed, among many others. Household chores, while traditionally the domain of women, are no longer so, given that women now outnumber men in the workforce with fewer staying at home and doing the ‘job’ of homemaker, or household manager. Some couples are developing a flexible mindset towards their careers, with either the mother or father taking turns to be home with the children for a couple of years while the other partners pushes forward on the work front. Other parents do timesharing where one parent negotiates to start work at 5 or 6am finishing early in the afternoon to fetch the children from school and go home with them, while the other partner deals with the children in the morning, gets to work later and leaves later. This can work where employers are progressive. Men are also enjoying using cooking as a form of self-expression and pleasure and will happily share the load or take on this role completely, in amongst many other chores. In fact, doing chores and who does them is being reinvented and is beautifully illustrated in this television advert from OMO which was released in 2017, putting a father at the center of chores. This was further substantiated later in the same year by the introduction of the Paternity Bill which grants fathers 10 days paternity leave on the birth of his baby. 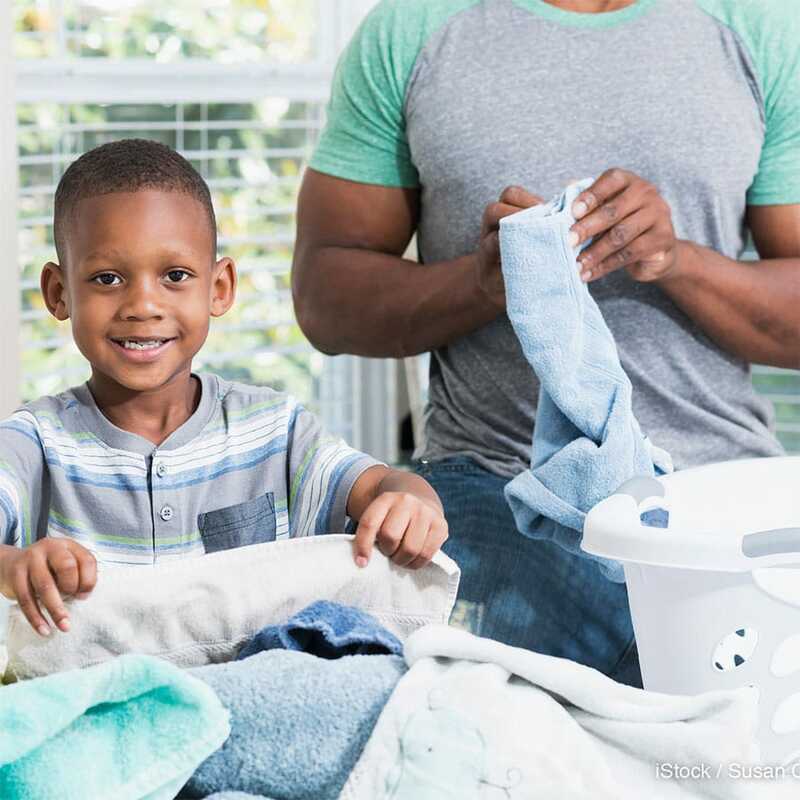 With more single parent households, whether children are staying with their mother or father, the fact is that chores have to be done in both homes, with both mum and dad. In South Africa, we suffer from a serious absence of father figures which means that dads are not there to role model doing the chores for their children. 57% of children are growing up without their dads present in SA according to a recent report published by the South African Institute of Race Relations in July 2018. This means that the old African adage that it takes a village to raise a child, is now more important than ever. Therefore, we must celebrate other parental figures that step up to the plate and into the shoes of the absent parent, giving so freely of their time and their love, such as grandparents, aunts, uncles and friends. They might just be the ones getting children involved in doing chores with them. Children who grow up doing chores as part of daily life are prepared for the daily grind that underpins everything and are not left helpless on the rocks when they leave home. My son went to weekly boarding school for the past four years and the first time he came home on the weekend with a full bag of washing, because he had forgotten to hand it in at the school laundry, I showed him how to use the washing machine and the iron. I was not going to let his problem become my problem. While it may sound harsh, it was not a punishment at all. It was matter of fact, almost academic, as we had already agreed up front that if he forgot, he would be responsible for doing his own laundry. In the process he learned a whole lot of skills that have made him more competent, and for which he is quite grateful today. If I had molly-coddled him and done his washing and ironing for him, he would have learnt nothing and the next time he forgot, he would have expected me to do the same. We must not be slaves to our children. We are in this thing called life TOGETHER. I believe that chores provide the foundations of resourcefulness and independence in our children which lead to inherent confidence and an ‘I am, I can, I will’ mindset. These are much-needed competencies in the 21st century. 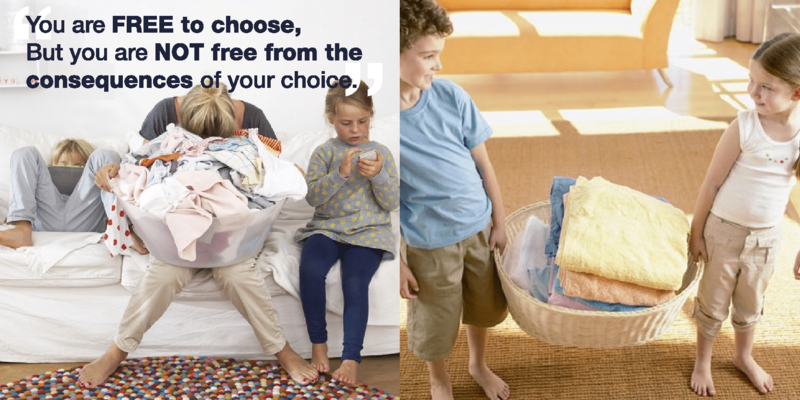 Doing chores is another way of future-proofing our children. The life skills acquired by doing chores are not part of the formal academic curriculum, they are part of the hidden curriculum. In fact parents are the hidden curriculum passing on the baton of responsibility to their children slowly but surely. Be invitational – invite your kids in to do the chores with you and eventually they will get really good at them and be prepared for life. And do start young. When children are little, they look up to their parents or other adult role models who are their primary caregivers and want to get good at what they see them doing over and over again. So let them. Another long-term benefit is that you are not left serving children hand and foot, as they get older they will serve you too. It works both ways. Step up to the plate and partner with your children on this very important journey. And, never forget, families that do things together, even the chores, are more likely to have strong bonds of togetherness, no matter what their size or make up. Family is whatever family means to you! Chores can be the consistent glue that makes families work.